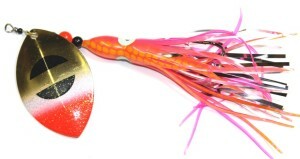 GDF Introduces its latest line of Hoochi Spinners, The Razzle Dazzles! Featuring the same high quality parts, and durability you can depend on, GDF Razzle Dazzles are made with mylar for an extra attractant! You can choose to make any of our hoochi spinners into GDF Razzle Dazzles by going to your favorite hoochi spinner and choosing YES the “Razzle Dazzle” option in the box below the blade and hook size options. Custom orders available by calling us at 503-428-8077. 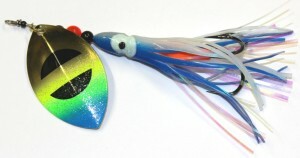 You can make any GDF Hoochie spinner into a Razzle Dazzle Spinner by selecting YES in the drop down box labeled “Razzle Dazzle” under each hoochie spinner when ordering online.